Very soon, Go Set A Watchman (#GSAW), the sequel to one of my favourite books of all time: To Kill A Mockingbird (#TKAMB), will be published. In early 2014, I began re-reading #TKAMB as a reminder of what I aspire to when writing my books. How glad I am I did. Picking up the book, opening it and starting the re-read was an exercise in pure pleasure, it was like falling in love all over again. Each page reminded me how important the book was to me when I was a child. It was a book about a girl like me; a girl who loved to read, who was a bit of a tomboy – not that I ever got into fights like Scout – and was obsessively curious about what made other people tick. Though I didn’t realise it at the time, of course, that’s an important and powerful message to send to a young girl via book: to tell her she can be the hero of a story and the plot doesn’t centre around how she looks, how she dresses, if she is pleasing to the male gaze. Nowadays, how a girl looks seems so often to be valued over her intelligence, that I’m grateful I was given the chance to read a book that has none of this. I’m also grateful to have been given the same opportunity to learn about overt and, just as importantly, subtle racism through the Tom Robinson storyline. The tale of a black man falsely accused by a white woman of a hideous crime is so very relevant especially in today’s seemingly liberal world, where such stories shown on news and discussed on social media, often polarize people and damage friendships just as it does in the book. Reading about it at a young age was also a window into that world when so much of black history wasn’t discussed or even acknowledged. I believe it was a gift for me to be ‘forced’ to read #TKAMB as a child for the gentle, insightful way it introduced me to big issues and that’s why I think it’s wrong that it has been removed – by the Government – from school curriculums. This re-read as a grown up has revealed so much more to me that I can only really appreciate now. 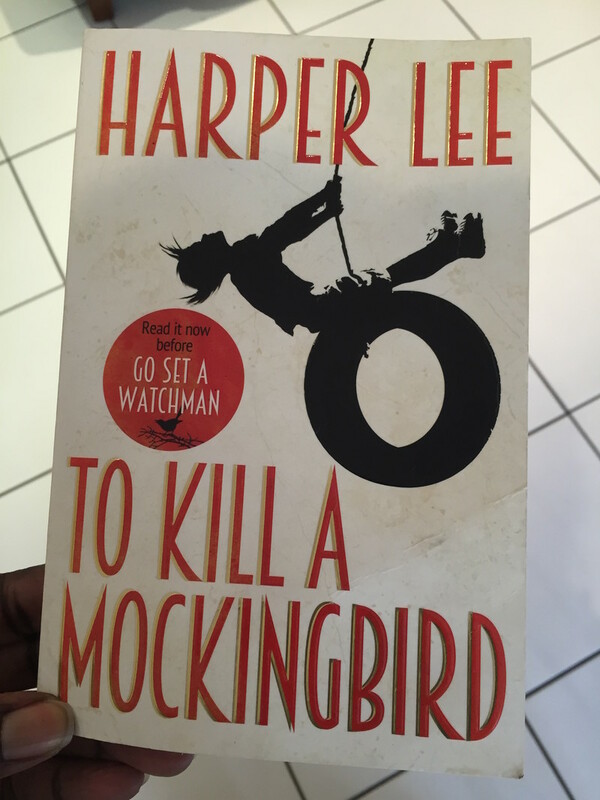 Despite the serious subjects covered, I can now see so much of the humour infused into the book – Harper Lee knew how to balance pain with laughs, and I can now see things that went right over my head a child. The way the story is told with the language, insights and reasoning of a child, is precious and awe-inspiring. What truly speaks to me as a writer, though, are the characters. They are sublime, realistic – every person (even the minor ones) is written with layers, with understanding and a careful, considered touch. I cannot explain how much I adore the people who make up the small town of Maycomb. Due to the deep affection I have for #TKAMB, I have to admit the excitement I feel about Go Set A Watchman is tempered by fear. I have the loved #TKAMB for decades, will I still love it after I see who Scout, Jem, even Atticus, grow into? Will one of my first loves be forever ruined by something new? Maybe, maybe not, but, I’m just going to have to be brave. On 14 July, I will buy myself a copy of #GSAW, take a deep breath and start to read. Why? Because the bottom line is that Harper Lee is a fabulous writer, #TKAMB grew from #GSAW and very little can shake my love for #TKAMB. No matter how scared I am, I’m going to read it anyway. I hope the little girl I was who identified so much with Scout would be proud.